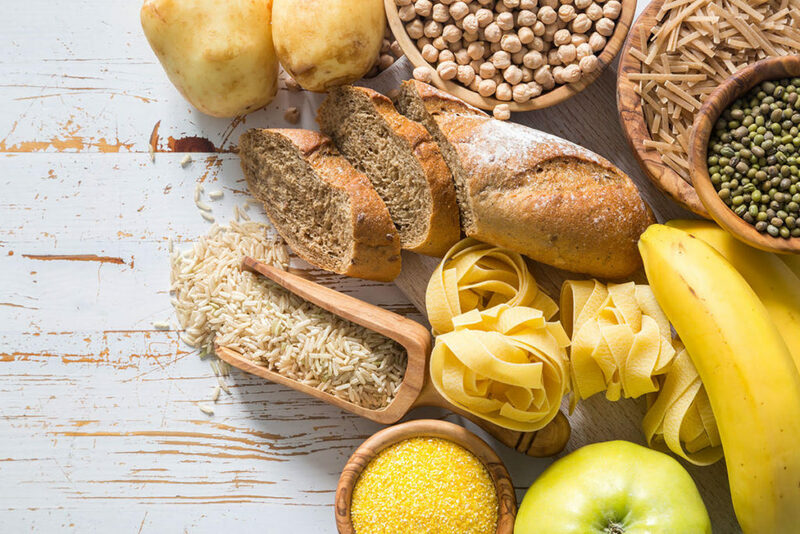 Carbohydrates are made up principally of sugars, starches and fibers, and are one of the three macronutrients consumed by humans for energy and function. Fats and proteins are the other two macronutrients most consumed by our agathokakological species. There are an enormous range of carbohydrate-containing foods, and all carbohydrates themselves are not created equal. The best sources of healthful carbohydrates come from whole foods, such as whole grains, beans and legumes, fruits and vegetables. In addition to a healthy balance of sugar, fiber and starch within these unprocessed foods, they often contain valuable micronutrients (vitamins and minerals), and phytonutrients. Processed carbohydrates, on the other hand, which include refined grains derived from wheat, rice and corn (which is also high in starch), and refined starches from potatoes, offer little nutritional value. These refined grains and starches are the base ingredients of common unhealthful foods like white bread, white rice, pasta, potato chips, sweetened fruit drinks, salty and sweet snacks, and sodas. The shifting dietary trends towards higher consumption of processed foods and refined carbohydrates around the world, is one of the largest reasons for the growing global epidemics of obesity, type 2 diabetes and heart disease. Considering carbohydrates as sugars helps to illustrate the damage that refined carbohydrates can do to the human body over time. Simple carbohydrates are themselves made up of simple sugars; either single sugars called monosaccharides, such as glucose or fructose, or two sugars (disaccharides) such as sucrose, which is half glucose and half fructose. These simple carbohydrates are typically found in the refined and processed food forms mentioned above, and are easily digested. It should be noted that certain highly processed food additives, such as maltodextrin, which is a component of many candies and soft drinks, is technically a “complex” carbohydrate (a polysaccharide) derived from starch, but has been engineered to be easily digested and has no health benefit. When carbohydrates are consumed, they are broken down in the digestive system into sugar(glucose). This glucose provides valuable energy to the cells in the body, which absorb the glucose with the help of insulin. However, if carbohydrates are too easily digested (fast “carbohydrate metabolism”), they flood the bloodstream with glucose faster than the cells can absorb it or insulin can be produced to help in the process, leaving large amounts of glucose in the blood. This unused energy can also be converted into and stored as fat by the process of “lipogenesis,” leading to weight gain. If this process of excess glucose in the bloodstream happens with regularity, cells, tissues and vessels within the body will become damaged and stop responding to insulin properly, a condition known as insulin resistance. Eventually if changes are not made to the diet, blood glucose levels will remain consistently high (hyperglycemia) and type 2 diabetes and cardiovascular disease can result. A whole food, on the other hand, will have fiber to help slow the absorption of these sugars, specifically glucose, into the bloodstream, meaning there will not be this spike in blood glucose levels when consuming whole grains or whole fruits and vegetables, for example. The pancreas will therefore not be overburdened to synthesize enough of the hormone insulin to help keep blood glucose levels in check, and glucose homeostasis can be maintained. Whole foods typically contain complex carbohydrates, made up of polysaccharides (three sugars or more linked together) in addition to fiber, phytonutrients, protein, fat and micronutrients, all leading to a gradual absorption of healthy and balanced energy and nutrition into the body. A helpful way of quantifying how large an impact a particular food has on blood glucose levels is called glycemic index, which is based on the amount of carbohydrates within a food and how quickly it is absorbed. Perhaps even more helpful, especially for diabetics, glycemic load goes a step further in considering realistic portion sizes associated with each food, giving a more real-life estimate of how blood glucose levels will be affected by the consumption of a particular food. The AJCN published a fairly comprehensive guide for glycemic index and glycemic load, but as a general guideline, eating a whole food such as a whole grain or whole fruit, has a much lower glycemic index and glycemic load than in its processed, refined, sweetened or liquefied form.